About two years ago, I bought a high-end electronic air purifier. I have three cats and a dog, and I’m allergic to all of them. Yes, yes. Why do I have things in my house that make me sneeze, itchy, and stuffy? I submit Exhibit A. They are too damn cute, and they make me laugh every day. So I’d rather run an air purifier 24/7 than part with the beasties. The purifier has multiple settings, low through turbo. If I leave it on low, it will automatically detect toxins and allergens, and kick into turbo to clear the air. I noticed early on that whenever I spritzed room-deodorizing spray, burned scented candles, used glass cleaner, or wet mopped with one of those mopping “systems”, that purifier immediately went turbo. No matter if I was a foot or a room away from it. So I wondered if it would do the same when I diffused my Young Living essential oils. Nope. That air purifier was a foot away from my diffuser, and it kept purring softly like a baby kitten, rather than roaring like an angry lioness. And that purifier kicked into turbo. 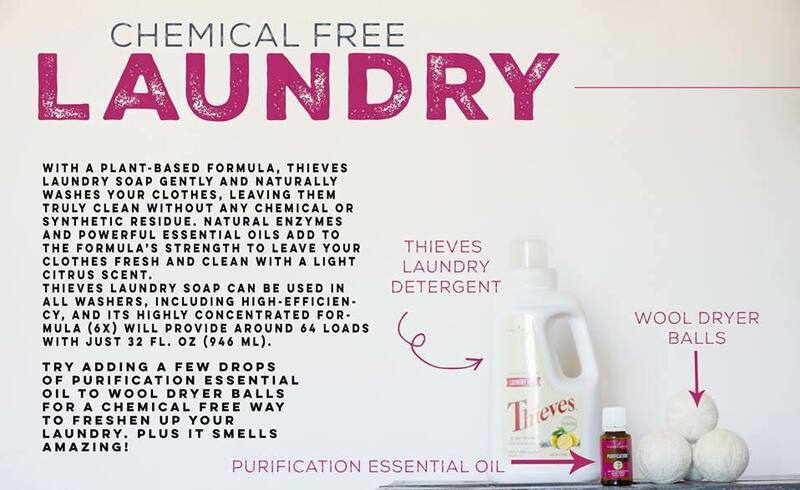 I have not yet replaced all my cleaning supplies with Young Living, namely Thieves laundry soap. So this particular batch of laundry had been washed with my long-time favorite detergent, one of the more expensive available, and usually commanding most of the laundry isle. You know the one. I don’t have to name it. I was devastated, to say the least. This detergent and I had been through decades together! It has been my brand favorite. No others would do. Coupons. Sales. Giveaways. Nothing has ever induced me to change. Until now. If clean laundry that had sat for days could be rustled only to send my air purifier into overdrive, something was wrong. Time to clear out, clean up, and get not just those allergens but those toxins out of my house. Farewell, old friend. I won’t miss you.